I am now ruminating on these two words, but I am still confused. Could someone help me understand when or under which circumstances should I use amicable or amiable? 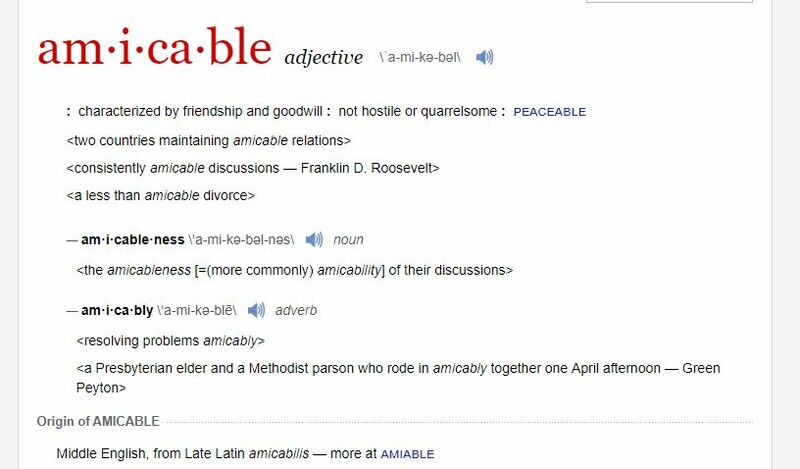 "Amicable" refers to a friendliness or goodwill between people or groups. While the term "amiable" refers to one person's friendly disposition. The amiable people might have an amicable meeting. He often attends an amicable meeting because he is amiable. I found an amicable Cricket team today, where every player was amiable. Amiable means good-natured and likable. It describes people. Amicable means characterized by goodwill. It describes relationships or interactions between people. So, for instance, two amiable people might share an amicable friendship, or two amiable people might end their relationship amicably. Both amiable and amicable derive ultimately from the Latin amicabilis, meaning friendly. Amiable came to English from French in the 14th century and originally bore the sense now associated with amicable. It developed its modern sense shortly thereafter. Amicable entered English in the 16th century, already bearing its modern sense. 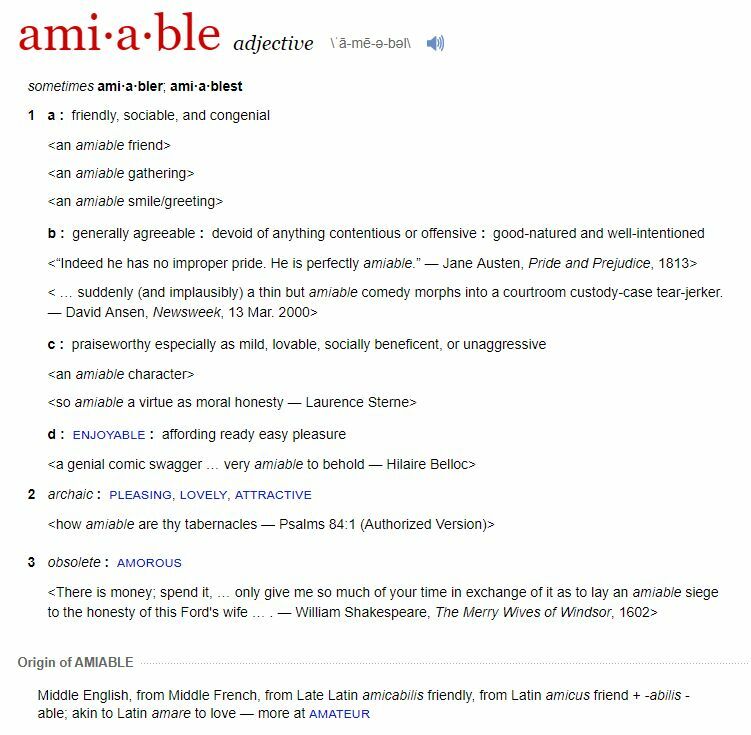 Note: Usage of "amiable" has become rather rare in modern English, and it is becoming fairly rare to directly describe a person as "amicable". Amicable is more regularly used to describe an agreement, divorce, or other non-person-event involving people. Amiable is more about emotion, likability, and social engagement. Amiable is almost exclusively used to describe an individual person. An amiable person greets you with a smile and treats you as a wonderful friend. "Alice is the most amiable person I know, everyone loves her." Amicable refers to a willingness to reach a mutually agreeable solution to conflicts. An amiable person will usually also be an amicable person. However amicable is probably more often used to describe an agreement itself. "Alice is an amicable person, she is always able to find a fair and reasonable compromise". "Alice and Bob quietly hate each other, but their divorce was swift and amicable. They sold their home and divided their money and possessions without any disagreement." Important note: In a corporate or legal context "amicable" is often used to describe almost any out-of-court agreement. In this context "amicable" lacks any positive connotation of friendship, goodwill, or even reasonableness. "GiantCompany issued a press release saying they reached an amicable agreement with SmallCompany to settle their court case. However several employees at SmallCompany said the lawsuit was frivolous and described it as blackmail. They say SmallCompany only paid the settlement because it was cheaper than spending millions of dollars to win a ten-year court battle." The press release calls it an "amicable agreement" attempting to benefit from the positive connotation of amicable, regardless of the fact that other party considers the agreement to be blackmail. Amicable has suggested the capability of agreement (amis,) whereas amiable is outright friendly. If you see amicable polity, perhaps they want a finite amount of sacrifice in return for their peace (hazard on each side being perhaps moderate or subject to parley;) if it's amiable, you are seeing people who would improve you and themselves. Not the answer you're looking for? Browse other questions tagged meaning word-choice word-usage differences or ask your own question. What is the difference between providing that and provided that? The difference between 'credit' and 'accredit'?